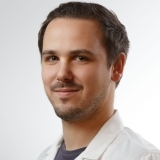 I am a Postdoc at the Medical University of Vienna, Center for Medical Physics and Biomedical Engineering. My current research relates to multimodal preclinical imaging, where I develop a novel optical coherence photoacoustic microscopy system. In my PhD I researched novel optical coherence tomography (OCT) systems for early diagnosis of several eye diseases like glaucoma. I mainly focused on Doppler OCT (D-OCT) and the development of a three beam D-OCT system capable to quantitatively measure total retinal blood flow in-vivo without prior knowledge on the vessel geometry, which is a requirement for standard D-OCT.
My main scientific interest lies in multifunctional optical imaging, photoacoustics, OCT-angiography, Doppler and polarization sensitive OCT and in/ex-vivo clinical and preclinical studies. Haindl, R. et al., 2014. Three-beam Doppler optical coherence tomography using a facet prism telescope and MEMS mirror for improved transversal resolution. Journal of Modern Optics, 62(21), pp.1781-1788. Available at: http://dx.doi.org/10.1080/09500340.2014.983569. Felberer, F. et al., 2015. Imaging of retinal vasculature using adaptive optics SLO/OCT. Biomedical Optics Express, 6(4), p.1407. Available at: http://dx.doi.org/10.1364/BOE.6.001407. Trasischker, W. et al., 2014. Single input state polarization sensitive swept source optical coherence tomography based on an all single mode fiber interferometer. Biomedical Optics Express, 5(8), p.2798. Available at: http://dx.doi.org/10.1364/BOE.5.002798. Beer, F. et al., 2017. Conical scan pattern for enhanced visualization of the human cornea using polarization-sensitive OCT. Biomedical Optics Express, 8(6), p.2906. Available at: http://dx.doi.org/10.1364/BOE.8.002906.